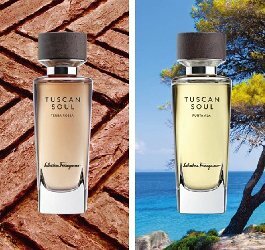 Salvatore Ferragamo will launch two new additions to the Tuscan Soul Quintessential Collection (see: Bianco di Carrara, Vendemmia, Viola Essenziale and Convivio), Terra Rossa and Punta Ala.
Terra Rossa ~ Developed by perfumer Domitille Bertier and inspired by the city of Siena and the red Tuscan clay. With citrus and floral notes, patchouli, myrrh and amber. Punta Ala ~ Developed by perfumer Alberto Morillas and inspired by the seaside resort of the same name. With citrus, olive leaves, cedar and vetiver. Ferragamo Tuscan Soul Terra Rossa and Punta Ala will be available in 75 ml Eau de Toilette. Great news! I own and like the original, and would love to try these. Oh … had no idea there WAS a “last collection”. The original Tuscan Soul disappeared from shop about a year ago. Got this one over the internet, and most internet shops here do not carry fragrances that were never in a brick-and-mortar store for fear customers would be reluctant to buy them. See link in 1st sentence above…there were 4 of them. I just tried the original 4…. lovely lovely lovely. I really liked a couple of these original 4… but they are quite expensive at USD 200-ish. Well.. let’s wait and see! Glad to hear they’re nice! I’ve still never laid eyes on them.